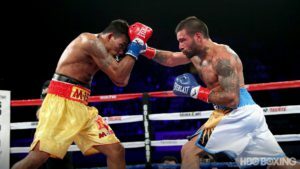 Venezuela’s Carlos Canizalez, 20-0-1, opened up the ESPN+ live stream broadcast of the Manny Pacquiao-Lucas Matthysse fight by facing China’s 1-0 Bin Lu at the Axiata Arena in Kuala Lumpur, Malaysia on Saturday night (American time). The bout, which was for a WBA version of the flyweight title, started in exciting style, with both fighters engaging fully and trading powerful shots. By the end of the fourth, however, the defending champion, Canizalez, starting working effectively on his man. By the middle of the fight it was clear that Canizalez was the stronger of the two while Lu Bin would occasionally reach in to land. Canizalez worked the body, and the by the ninth, Lu Bin was visibly weakening. Canizalez hammered his man again in the 11th. Lu Bin as game and not without skill, but he was still the victim of a technical knockdown in the round (the ropes held the man up). With just seconds left in the 12th , Canizalez sent his man to the mat. Lu Bin got up, but the referee stopped the fight. Next up came a featherweight bout for another WBA title. Edivaldo Ortega, 26-1-1, of Mexico was facing the 21-0 Jhack Tempora for the vacant belt. Tempora came out swinging in the first. Right off the bat, the man was engaging in effective body work. Ortega looked better in the second, but Tempora ended the round rather strong. The first third of the fight proved to be tight and close, but Tempora looked to have the edge. Ortega gained ground over the next few rounds, but by the sixth Tempora was able to work from range. Things remained close…until the ninth when Tempora dropped his man. Ortega got up, but Tempora wasn’t going to let him go. Letting loose with this punches, Tempora stopped Ortega before round’s end. It was time for the main event. Pacquiao, 59-7-2, stepped into the ring to face Matthysse, 39-4-0, for yet another WBA belt, this time in the welterweight division. Matthysse never had a chance. The Argentine landed well on several occasions, but Pacquiao proved to be a tsunami, completely overwhelming his man. The first round saw the Filipino dominating. Matthysse fought well enough in the second, but Pacquiao still had the edge. By the third, Matthysse was down for the first time. He got up, but Pacquiao was flurrying so aggressively that the titlist couldn’t mount anything consistent. Still, Matthysse held his own in the fourth. He didn’t do enough to win the round, though. By the fifth, Pacquiao made his man take a knee. The sixth was a close, but not close enough to give to Matthysse. And by the seventh, it was all over. Anyone with eyes could see it was only matter of time, but at just over the two and a half minute mark of the round, Matthysse was sent to the mat for the last time. 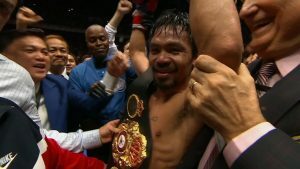 Pacquiao had his first knockout win in years. Mano a mano, or should we say Manny a mano? 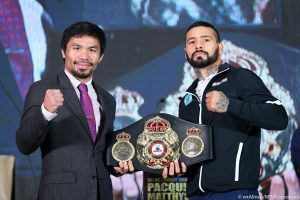 Basically what I’m trying to say is Manny Pacquaio is BACK in the ring this weekend as he vies for yet another world title – the WBA Welterweight belt – in a battle with, Argentine champion, Lucas Martin Matthysse. Fighting for the first time since his, allegedly controversial, loss to Jeff Horn last July, Pacquiao is again fighting away from home with this super-bout taking place in the Middle-Eastern hub of Kuala Lumpur, the Malaysian capital. The Filipino eight-weight world champion will be competing in his 69th bout and aged 39, nearly 40, there is a genuine concern that whilst he may still love being in the ring, the ring may not love having him in there and I say that because against Horn, whether you like it or not, he looked a shadow of his former self with his defence being easily penetrated, his footwork visibly slower and his head getting muddled relatively easily. Of course being of such a supreme ability means that even the slightest dip in quality will be magnified a thousand times and let’s not suddenly believe that Pac Man is a bad fighter overnight, he’s not, he still possesses quality that many fighters could only ever dream of and what you can never takeaway is the fight intelligence that the 5’5.5 fighter has. Most notable, in terms of differences, is the lack of Freddie Roach in the corner of the Filipino with Pacquiao seeking to go down a different route despite having secured his highest of successes with his iconic trainer and has, instead, opted to have Buboy Fernandez coach him in the build up to this fight. A natural talent burgeoning with aggression and a glee for the sport, Pacquiao will go about this bout no different to any that came previously, he will seek to dictate the pace of the fight from the early stages, cutting off the ring whilst jumping in and out of all four corners and flurrying his trademark body punches with grit and desire. The question mark around such a star is not whether he still possesses the ability, he will always have that, but rather one of how faded he has become? If anyone can beat father time, however, the father of boxing is surely that guy. For a man coming off the back of such a bloody, brutal loss to Jeff Horn, Matthysse is one hell of a risk with La Maquina being one of the most vicious punchers currently in action, certainly a man with bad intentions who goes into fights wholeheartedly expecting a knockout. Widely touted as the next big thing, Matthysse’s career took a bit of a bump when he was narrowly out-pointed by Danny Garcia in September 2013 and whilst the rebuild from that went well he was comfortably beaten by Viktor Postol, via 10th round TKO, in October of 2015. This is a guy who loses to the elite and only the elite – Zab Judah and Devon Alexander are the only other names to have bested the 35 year old – and in his hand, boy does he possess some power. There’s an argument to be made that Matthysse has hands made of bricks such is the extent of his demolition. Against Tewa Kiram, at The Forum, in January of this year we witnessed an incredible display as with the right hand sending Kiram down to the canvas in the eight before a murderous left finished the job within the same stanza to set up this legacy-defining contest with Pacquiao. At his best when involved with a brawl, the Argentinian is capable of making even the dirtiest, feistiest, most fearsome of scraps look like a majestic work of art with his elusive body movement, tempestuous shot selection and vicious intent marking him out as a guy you do not want to let into any sort of a rhythm. This reminds me of a gentle watercolour of a raging bull running through the streets of Pamplona, Pacquiao the artist, Matthysse the bull. But who is it that can claim the glory for such a visual spectacle, the artist or the bull? Lucas is a strong and determined fighter. Believe me that he is a very determined fighter. The mental aspect is the most important aspect of this fight. We know that Lucas Matthysse works very hard. They call him “La Maquina” for a reason. He is still training like never before. The fact that he always wanted this fight, a dream fight for him—believe me he will be in the best condition for this. He is very focused. This is an even fight. This is a dangerous but winnable fight. These two fighters love pleasing the fans. They are come-forward fighters. This fight will have a lot of action. Pacquiao has a very unique style. When I fought him, I thought he was going to get tired. He never got tired. So, I don’t know what Pacquiao we are going to see for this fight. I don’t know how distracted he may be. I do know that Matthysse is fully focused and determined. This is the fight of his life. It’s all going to depend on how Pacquiao reacts when the first bell rings. Will it be a distracted Pacquiao? Or a Pacquiao that everyone is used to seeing? That’s why the odds are 2-1. It is a great fight. I was already a promoter when I fought him. So, I’ve always been very optimistic that I would still be working with Manny after so many years. I always felt that life comes around full circle and puts us together. The fact that Manny has his own promotional company and the fact that Golden Boy Promotions has been involved in so many of his fights made me optimistic that we would work together again. I’m still hoping that we promote more fights together. Once he’s retired, we can do a lot more together. If I were Lucas, I would not get frustrated because Pacquiao can frustrate you. He can do that because he throws so many punches. Lucas has to be cool, calm and collected. He has to force the action. He has to show Manny that he is younger, stronger and fresher. If you don’t show that to Manny, he can walk all over you. That’s who he is. That’s why he’s so good. I’m grateful to be a part of this event. I want to thank Manny Pacquiao and his team. He is a great fighter and a legend. His team is great and professional. I want to thank Golden Boy for giving me the opportunity to work with a lot of elite fighters as is the case now with Lucas Matthysse. I imagine many of you have Facebook, with a healthy number of boxing friends on your news feed. What I see on mine, constantly, are fighters who can’t come up with enough complaints about promoters. Dirty, greedy people – who needs them, right? They show equal disdain for matchmakers and booking agents. Many of them are out of work, boxing-wise, which might explain some of the vitriol. Yes, their frustration is at times understandable, but the truth of the matter is, not a lot of fighters have made any money at all without someone promoting a fight. I usually have a very simple answer for them – hey, there’s no law against you guys putting on your own show, or pooling your resources to do so. There almost was, you know; back when Sen. John McCain was pushing his bill for national regulation of boxing, he had to agree at one point to a compromise with his Democratic counterpart Harry Reid of Nevada, who was being lobbied by promoters within his own jurisdiction who were protecting their own interests. So the idea of fighters being able to being their own promoters was taken off the table (except for those who were grandfathered in). That particular bill never passed. As a result, fighters continue to be allowed to both manage themselves and also promote themselves, and those who have reached a sufficient level of success can pull it off. We’ve seen this happening in recent years – Lennox Lewis had Lion Promotions, and of course Floyd Mayweather has his own promotional outfit, although he hired other promoters to do the “nuts and bolts” on the events. Winky Wright, a recent Hall of Fame inductee, ventured into this somewhat less successfully. Most famously, Oscar De La Hoya, in the process of breaking away from Bob Arum and Top Rank, formed Golden Boy Promotions to create some independence for himself, and while his popularity as an active fighter was essential to leveraging dates out of networks, which was necessary to help the company take off, Golden Boy has certainly survived beyond that and become a full-fledged entity on its own. Mayweather Promotions would like to be able to duplicate that for the long term. This won’t make me popular in promotional circles, but every fighter of any stature may want to consider such a thing; again, if they have the leverage to make it work. Which brings us to the case of Manny Pacquiao. Some of you may not be aware of this, but Pacquiao has actually been a “promoter” of sorts for years, and through his company, MP Promotions, he’s had a deal with Top Rank that brought him something in the neighborhood of 27.5% of all revenues from his fights (that includes not only pay-per-view, but also live gate, sponsorship, foreign TV, etc.) and I imagine, this was for the most part against a guarantee. In effect, he was a promotional partner. That was not really a “risk” situation for him. He brought the “talent” portion, while Top Rank took care of everything that was outside of the ring. Now it’s a bit different. MP Promotions is the lead promoter for Saturday’s fight with WBA “regular” welterweight champion Lucas Matthysse (39-4, 36 KO’s) that is taking place in Kuala Lumpur, Malaysia. And there’s a little more risk involved, as in risk that the fight would fall out unless Pacquiao’s company was able to guarantee the $3 million that was to go to Matthysse and his promoter, Golden Boy, and put it in escrow. Reportedly that led to some anxious moments, although the Pacquiao camp expresses that it was never any problem. 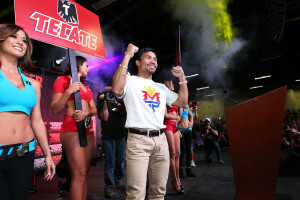 There was a little mud-slinging from one of Pacquiao’s publicists, Aquiles Zonio, who said that Arum was trying to disrupt the fight by planting seeds of doubt with the Malaysian interests who had put the money together, and that in the past, knowing that Pacquiao had irreconcilable problems with the IRS, he had “sabotaged” efforts to fight outside the States. So as you can see, there’s some bad blood circulating. But not enough to prevent business from forging ahead. 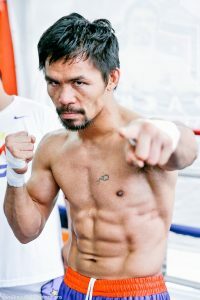 You see, like some of the other fighters who wanted to turn into promoters, and who may have become do-it-yourselfers only to facilitate their own fights and nothing else, Pacquiao realizes that he doesn’t really have the infrastructure to carry off a first-class promotion from Point A to Point Z. So while we’re not sure what the whole contract status really is, Top Rank is still around. According to Arum, his company is there to “handle the logistics (through my old USA Network colleague, Brad Jacobs), handle the undercard and handle the television,” which means they’re handling an awful lot. He wasn’t going to make a move, however, until Pacquiao got his money in place, and everybody tells me he wouldn’t have been too upset if that hadn’t happened, since he would have liked to put together Matthysse with Crawford. And so we move forward. Pacquiao has the fight being simulcast on all three major TV networks in the Philippines, ensuring maximum visibility. And in the U.S., Arum has placed it on ESPN Plus, where he gets $2 million a show. Sales for that app are said to be slow, so we’re not really sure how many viewers they’re actually going to have. This is not PPV-dependent, and Pacquiao, who is said to have pocketed $160 million for his fight with Floyd Mayweather, will probably get in the neighborhood of $10 million for this. But then again, he’s the promoter, right? So he could also make more on the “upside.” And he’ll be without Freddie Roach for the first time in a while, as Buboy Fernandez took over the camp. If Manny wins, there is almost no doubt that he’ll continue to fight. And if he does, we wonder if these little battles with Top Rank will continue to take place. Jermaine Franklin (16-0, 13 KO’s), the 2014 National Golden Gloves super heavyweight champion, will try to stay unbeaten on Friday night at the MotorCity Casino Hotel in Detroit as he faces local guy Craig Lewis (14-2-1, 8 KOs) in a ten-rounder. “He keeps getting better and better and better,” says promoter Mike Acri of Franklin, who is from Saginaw, MI and recorded two amateur wins over Cam F. Awesome, who won the trials for the 2016 U.S. Olympic team……………. ONE Championship, which regularly engages in MMA, kickboxing and Muay Thai competitions and is a huge success in the Asian TV market, has announced that it is entering the boxing arena, and they have pulled off a major coup by inking a deal with Srisaket Sor Rungvisai, the WBC super flyweight (115-lb.) champion, who has two significant wins over Roman “Chocolatito” Gonzalez, which puts him on many of the top ten “pound for pound” lists. Pacquiao bought a stake in the company back in 2014. Does Manny Pacquiao Have One Last Fight in Him? Does the Great Manny Pacquiao have one last great fight in him? Promoter Bob Arum posed that question to fans on his twitter account and the boxing world will find out this Saturday in an unusual site for a Manny Pacquiao fight. 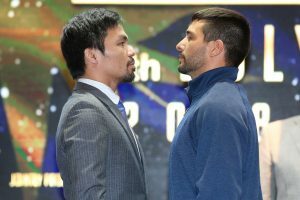 Kuala Lumpur at the Axiata Arena in Malaysia is the site for Pacquiao’s next fight when he takes on dangerous puncher and current World Champion Lucas Martin Mathysse (39-4, 36 KOs) in what should be a thrilling fight between two fighters who’s best days may be behind them. Pacquaio (59-7-2, 38 KOs) is seeking his 60th victory in what has been a legendary but now declining career where he’s no longer the superstar he once was, but is out to prove that he was the true winner in his controversial loss last July to Jeff Horn and perhaps there is still a couple of great nights left in his incredible career. 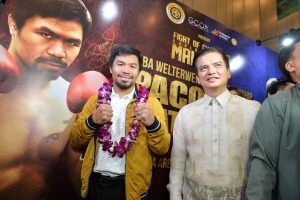 Not only is the site of the fight different compared to many other Pacquiao fight weeks, but the Filipino icon is the lead promoter of the event. Bob Arum and Top Rank are simply just distributing the fight in the United States and it will be shown on the ESPN + app, which has indicated that perhaps Pacquiao and Arum seem to be at odds with each other. Pacquaio continues to tell the boxing press that he’s no longer affiliated with Top Rank and is currently a free agent. Arum of course has downplayed the situation and maintains that his company still has a working relationship with Manny. This bout of course was not without controversy as in the weeks leading up into the event there were concerns that the event would be cancelled altogether as Pacquiao and his team missed numerous deadlines for payments. It wasn’t until early this month that Matthysse and his team were assured the money will put in place for his purse for the fight and now the fight is a go with Manny only slight favorite to defeat La Maquina. Many believe Pacquiao defeated Jeff Horn last summer, but just 4 months shy from his 40th birthday, a long layoff, and facing a big puncher. It could be anyone’s guess on what Pacquaio truly has left for the 69th bout of his career. Pacquiao fired his longtime trainer Freddie Roach and perhaps it was the right move now that Roach is no longer one of top trainers in the game. Buboy Fernandez his long time friend is now is head trainer and Buboy feels we will see a hungrier more dangerous Pacquiao, which could spell trouble for Matthysse. Obviously, the Filipino legend is nowhere near the fighter he was 8 years ago, but Manny is still a capable fighter with loads of experience, speed, footwork, and tremendous skills. Expect an impressive performance from Manny as he will notch his 60th victory and perhaps even end his knockout drought in a fun fight with Matthysse in Malaysia. 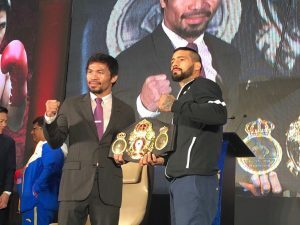 Manny Pacquiao and Lucas Matthysse kicked off the promotion for their welterweight bout in Kuala Lumpur, Malaysia on Wednesday by attending a press conference in Manila. Pacquiao (59-7-2) won’t have fought in over a year when he steps into the ring with the rugged Matthysse (39-4) on July 14th. The Filipino multi-titlist last fought in July 2017, when he dropped a highly controversial decision to Jeff Horn in Horn’s hometown of Brisbane, Australia. Yet Pacquiao, who is closing in on forty years of age, made it clear at the conference that he has no intention of retiring. One huge point of interest was whether or not Pacquiao would have Freddie Roach in his corner. It was announced last week that Pacquiao had fired his long time trainer. Days later, however, Pacquiao came forward to say the report was false, that he had yet to make up his mind who he would employ as the head of his corner. 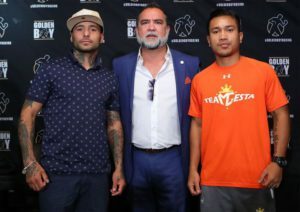 “Freddie and I are like family,” he said, before indicating that his longtime sidekick, Buboy Fernandez, might indeed be his main trainer for the bout with Matthysse. 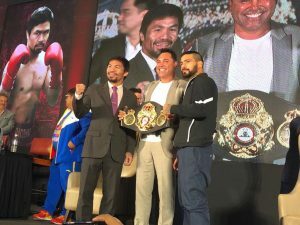 “Assuming I made the decision and chose Buboy Fernandez for this fight,” said Pacquiao, “I’m still not closing the door on Freddie.” Pacquiao indicated that he might eventually use Roach at a later date. 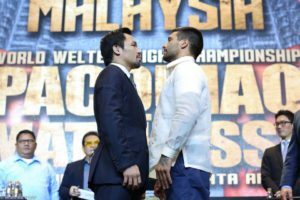 “ For the next fight,” he said, “we can always go back to Freddie.” The fight with Matthysse will be for the WBA World Welterweight Title, a belt Matthysse has held since besting Tewa Kiram in January. Following the madness of Wilder vs Ortiz in New York, and the anticipation of the upcoming Joshua vs Parker unification bout, you may be forgiven for forgetting about a potential barn stormer in between, in the form of Dillian Whyte v Lucas Browne. The two face-off this weekend at London’s O2 arena in a fight that should set the winner up for a world title shot. Last time out, the two heavyweight contenders had very different match-ups. 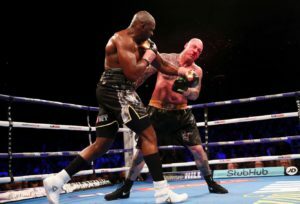 The WBC number one contender, Dillian Whyte, 22-1 (16KOs) took on Robert Helenius for the ‘not-so-coveted’ WBC silver title on the undercard of Joshua v Takam. For 12 labouring rounds, Dillian went in search of his opponent as the Swede evaded Whyte’s attack, but never replied with his own offense. The Brit’s accuracy was substandard that night, and way below the standard he set for himself in his fight of the year contender vs Dereck Chisora just less than a year earlier. In stark contrast, Lucas ‘Big Daddy’ Browne’s last fight was his return fight from a number of disputed failed drug tests that followed his come from behind 2016 victory over Ruslan Chagaev in Chechnya, for the WBA ‘Regular’ belt. Browne, 25-0 (22KOs) knocked out no-hoper, Matt Greer in the second round at the Punchbowl social club, Sydney, a world away from Saturday’s night venue. The fight told us very little about where Browne is at since his impressive victory over Chagaev 14 months earlier. That bout saw Browne knocked down and cut before steamrolling through the Uzbek in the 10th with continuous right hooks. That should’ve been the break out fight that setup potential showdowns with the likes of Wilder, Joshua, or even the not yet retired Wladimir Klitschko, but instead Brown returned two positive tests for clenbuterol and then eight months later, a positive sample for ostarine, for which Browne has tried to explain was from a pre-workout he took without checking the contents. Browne isn’t the only one with a questionable record when it comes to drugs. Whyte was suspended for two years back in 2012 when he tested positive for a banned stimulant. Like Browne, Dillian claimed it was due to a supplement he took without properly checking the ingredients. Concentrating on the two fighter’s actual boxing skills though, this has the potential to be a very gruelling but ugly fight. Neither fights with much concern for defence or seems to bothered about wasting shots, which seems strange for Browne who does have a tendency to cut easily, a weakness Whyte will jump on if the Australian does sustain a meaningful cut early on. Whyte of course has been knocked out, his sole defeat coming at the hands of WBA & IBF champion Anthony Joshua back in 2015 for the British title, and in his two biggest fights since, Whyte has had to come through adversity against Chisora and briefly in the Helenius fight when he was shaken by a left hook. So, if Browne’s power is legit, he should be able to significantly test Whyte’s chin more than once through 12 rounds of action. For the winner, a world title shot should be next. For the loser, heavyweight obscurity could await. Proving there’s a lot more than rivalry on the line on Saturday. Just a month on from his devastating first round stoppage of Joe Murray, Lewis Ritson, 14-0 (8KOs) returns to the ring for his second defence of his British lightweight belt against Scott Cardle, 22-1 (7KOs). 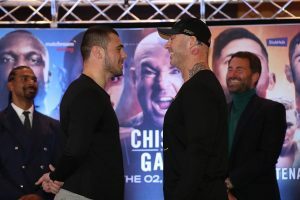 Ritson’s currently on a five fight KO streak, and though heavily favoured against Cardle, it will be a real statement from the Newcastle native if he can score another stoppage victory. Frank Buglioni, 21-2-1 (15KOs) will defend his British light heavyweight title for the third time against mandatory challenger, Callum Johnson. With the likes of Anthony Yarde, Hosea Burton and Bob Ajisafe waiting in the wings for a shot at the British, Johnson, 16-0 (11KOs) will be hoping to end the constant talk of potential future fights for Buglioni. The aforementioned Dereck Chisora, 27-8 (19KOs) is also a late addition to the card in what is expected to be a stay busy 8-rounder, since his majority decision loss to European champion, Agit Kabayel in Monaco last November.